The Nashville Predators have burst into the leagues elite over the last few seasons, further solidifying their spot after making it into the second round of the playoffs for the first time in franchise history last season. A major contributing factor to this success is Nashville's tight checking defensive style of play. There is not much room to move down in "Smashville". When an offensive scoring chance does manage to squeeze through the solid Predators defense, they have a wall in between the pipes by the name of Pekka Rinne. 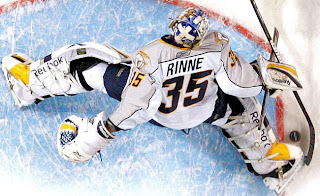 Rinne has become the bread and butter in Nashville, playing 147 games for the club over the last three seasons. Breaking the 30 win mark each of the last two seasons and missed 30 wins by one in '08-'09. It is no surprise that Rinne is on his way to hitting the 100 win mark, which he will likely hit next season being only six wins away from the milestone, when you see some of the saves he is capable of making. However, even when a puck does manage to squeeze by, sometimes the puck still manages to not make it to the back of the net. Much like Rinne's save on Shawn Horcoff of the Edmonton Oilers (see below). After Horcoff got a backhand shot off before he fell to the ice, the puck squeezed under pad of Rinne. A sure goal. Not in Nashville. The stick that Rinne had dropped moments before served as another defense man and redirected the puck before it crossed the goal line. This goal is a perfect metaphor for the type of hockey that goes down in Nashville. The second you think you have an opening, Rinne makes a big save, you get leveled by the "Tootoo train", or Shea Weber shuts you down before you can get a shot off, take your pic.